Romantic Circles has moved to romantic-circles.org as part of a change in its instutional support. Formerly published by the University of Maryland, College Park, it is now a publication of the University of Colorado, Boulder. Through this transition and beyond, we will continue to support our editors and contributors in the production of high quality, peer-reviewed scholarly work. You're not just seeing things: Romantic Circles looks different now! Our team of developers has been working for more than a year now on a top-to-bottom redesign of our site. Our focus has been to make RC more intuitive, navigable, and approachable across all devices and for our broad community. And it's not just a visual redesign—we've been working behind the scenes to improve site performance, search and recommendations, and much more. On this page, we'll share some of the improvements we've made and give you a sense of what's coming down the pike for RC in the months to come. This visual overhaul is just one part of a three phase redesign process. 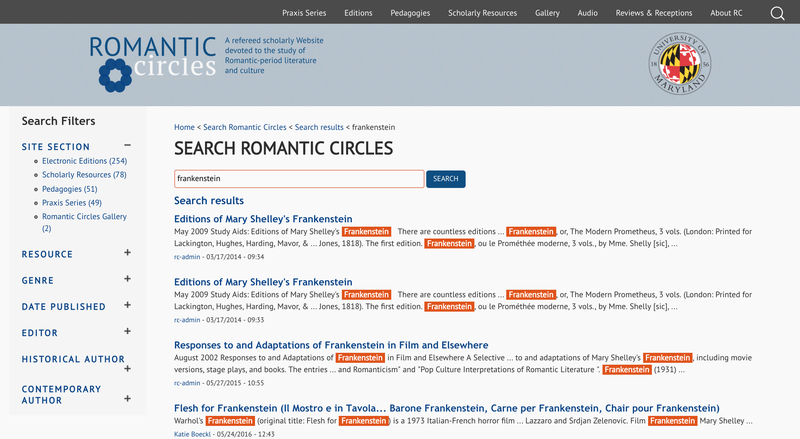 After twenty years, we're still working every day to expand the horizons of Romantic literary studies, and we're excited to roll out new tools and integrations for exploring both our rich archives and all the great work to come. We've overhauled our front page to better surface the broad range of materials we host. 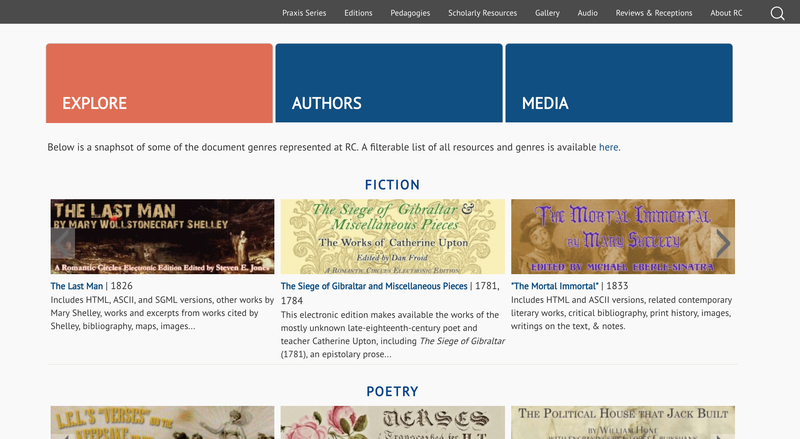 Not only can you always find the most recent work we've published here, you can also explore our collections by genre, author, or media type. We've made it clearer how we organize our content here at RC, so you'll always be able to find the work that interests you. We've overhauled our underlying search engine to make sure that the most relevant and interesting content rises to the top—while also making sure that there's room for exploration and seredipity. We've also fine-tuned recommendations across the site—so while you're browsing a Praxis volume you can easily surf through related resources and materials. Our main sections, from Praxis to Pedagogies Commons to Reviews and Receptions, have all received structural overhauls to make sure that it's simple to find what you're looking for. And as a plus, RC now looks better than ever on mobile and tablet devices! You're looking at the fruits of phase one: we've made RC better to look and easier to navigate than ever! For phase two, we're turning RC's data into a rich resource for all kinds of projects in Romantic literary studies. You can learn more about this project over at our RC Data page. We'll also integrate RC's resources with annotation and mapping tools, so you can interact with RC in new ways. Our third phase integrates RC with the Shelley-Godwin Archive. The Shelley-Godwin Archive is an unparalled digital resource for Romantic-period manuscripts, and we're working to bring it into the RC fold so you can search both sites at once, and make better connections across a range of resources.